You can upload and attach files to your posts here. No need for emailing files. v1.4 released, with added preview pane, support for copying font symbols as images, and some bug fixes. Thank you for making the 1.06 patch. When I saw WWFontEditor, translation commands and conquests made it possible. If grad6chi.ini exceeds 33k, WWFontEditor can not open it. If you can give me an e-mail address, I can send you the grad6chi.ini that I modified. Welp, v1.3 is released, and I think that just about finished this project. Can edit fonts from pretty much all pre-RA2 Westwood games. Character sizes can be adjusted (if the font format supports it). New characters can be added (if the font format supports it). Character data can be shifted up/down/left/right. Clipboard: Characters can be copied, even to other WWFontEditor instances. Has a text encoding dropdown to view character mappings for other encodings. Contains a Dune 2000 text encoding in that list, for the game's reordered special characters. Has a multitude of inbuilt palettes to show the font symbols. Color palettes can be edited on-the-fly by double-clicking the colours. Has support for adding and editing custom added palettes. The editor's colors and defaults can be customized in the settings. Yea, I've noticed. This is why I've replaced the previous image with an evil JPEG. Anyway, this conversion is done with GD. I do not have much control over it. The best I could try is to use a third party library. I'll see what I can do about it. By the way, Banshee, there's something wrong with the image caching on the front page. It seems to have changed a bunch of pure white pixels on the image to transparency... after somehow creating a mess of static in what were perfectly clear white areas in the original? Can you please add a license to the source code? The default of no explicit license means that nobody can (legally) do anything with it, including copying the code to modify and contribute fixes. Agh, sorry. I didn't make this thread; it's the copy thing for news. I never noticed. I fixed it. I added the full list of supported games / font types to the post, while I was at it. This will be very handy to have, thank you! 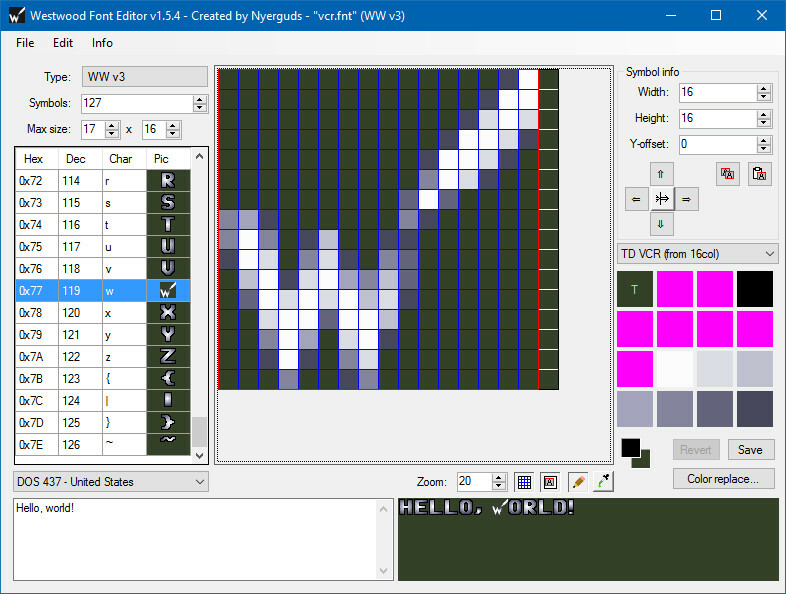 Since Siberian_GRemlin never actually released his font editor, and demand was growing from the community to have such a tool to allow more fan localisations of the older games, I thought, what the heck, I'll dive into it. So I decided to make my own font editor in C#. With the help of the RA++ team (Omniblade, CCHyper & Tomsons26, anyway) I figured out the font format itself, and managed to make code to read it and show it as image. Apparently this format is used for quite a bit more than C&C1 and RA1; we used fonts from Legend of Kyrandia as test material as well, and apparently this should support Dune II too.